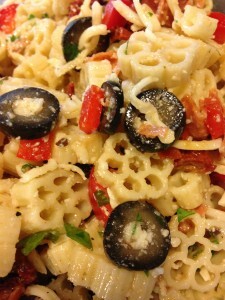 Easy Pizza Pasta Salad has been a mainstay for years on picnic and potluck buffets. All of the flavors of pizza converge into a simple pasta salad. Who doesn’t love pizza? Even kids will love it! Try my version with pepperoni, red bell pepper, mozzarella cheese, sliced black olives, and a fresh Italian dressing made with sundried tomatoes and garlic! Top with croutons and it’s pizza all the way! For a main course or salad course, serve the pasta salad over a bed of greens such as peppery arugula. 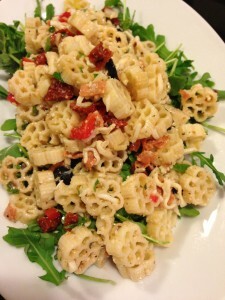 The arugula adds a nice “crunch” along with the croutons. 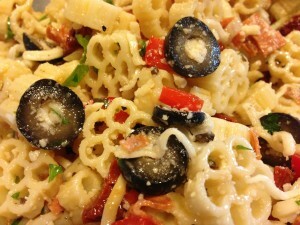 I think this is one of the most pleasing pasta salads for a party. 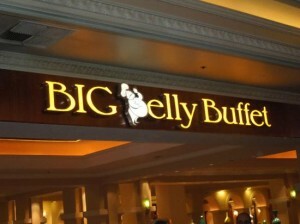 Keeps well on a buffet if kept chilled, and travels well for tailgate parties and picnics. Be sure to chill the salad overnight so that the flavors will meld together and intensify. 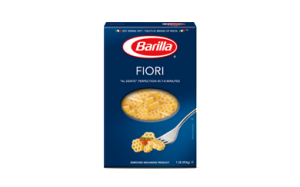 Barilla’s Fiori pasta is a great choice for pasta salads because the shape holds the dressing and it looks attractive. Feel free to use shells, fusilli, penne, or other bite-sized pasta. 1. Cook the pasta according to package directions. Drain and cool the pasta. 2. 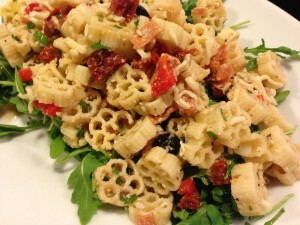 Combine the cooled pasta with the remaining items, except the croutons, in a large non-metallic bowl or container. 3. Refrigerate overnight or for up to 4 hours so the flavors will meld. Stir once or twice and add additional dressing if needed. 4. 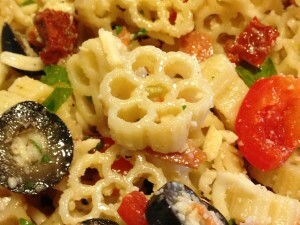 Add the bread croutons just prior to serving the pasta salad for some extra crunch. Serves 6 – 8 people as a salad buffet item. 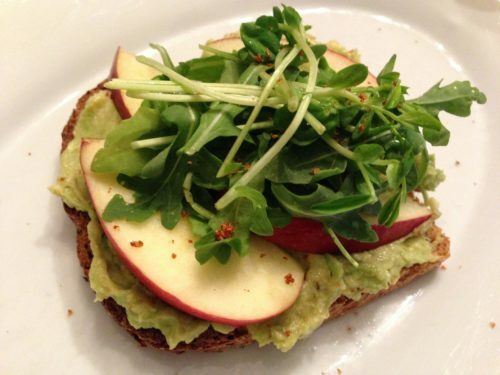 Serve over a bed of arugula as an entree or a salad course. Variations: Use fresh basil instead of the parsley. Substitute 1/4 cup chopped Vidalia onion for the scallion. Use bottled Italian dressing if you prefer a certain brand. Add sliced mushrooms and even some chopped fresh spinach leaves if you like the taste.